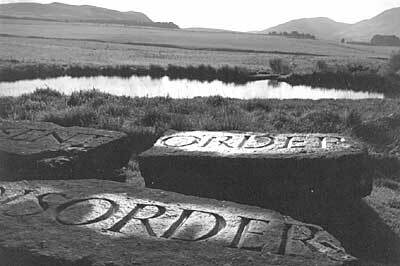 The Scottish poet Ian Hamilton Finlay is one of the most influential artists of the late twentieth century. Controversial, obdurate, famously irascible, he inscribed himself in Scottish culture as the eternal outsider, a poet in exile in his own land, constantly at war with an age that he claimed had lost an essential piety. His life’s work spiralled into a myriad of forms: most famously, as an ‘avant gardener’, he moved poetry outside the confines of the page with Little Sparta, a garden of sculptural poems he and his wife Sue Finlay created at a farm called Stonypath in the Pentland Hills near Edinburgh. Created throughout the 1970s, Little Sparta contains 270 artworks embedded in what Finlay described as ‘specific landscapes’. Towards the end of his life – he died in 2006 aged 80 – he was best known as a visual artist, exhibiting in galleries around the world. Finlay described himself, however, as a poet and philosopher (and, later in his life, as a revolutionary). 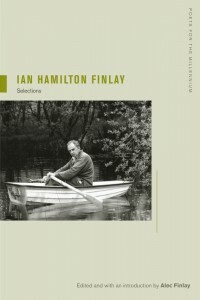 It is these aspects which his son Alec Finlay, also a poet, focuses on in Ian Hamilton Finlay: Selections. Gathering together work from Finlay’s small press publications, it includes writings that until now have been all but impossible to find, or have remained unpublished. Unsurprisingly, given its editorship, it offers an intimate, but dispassionately and scrupulously honest, portrait of Finlay himself. 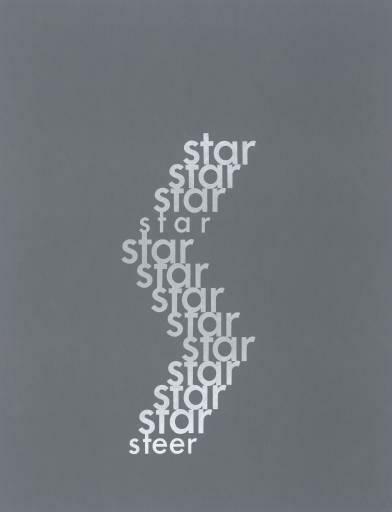 Most importantly of all, it reveals the full spectrum of this most fascinating of poets, offering a generous (and meticulously indexed) critical context which focuses on the poet’s own statements about his work. Like many poets, Finlay was an autodidact. He began his poetic life as a writer of short stories, and a ‘playwright who wrote poems’. The volume includes one of his early plays, Walking Through Seaweed, which demonstrates such an acute and subtle grasp of theatricality (derived perhaps from the ‘humanity’ that he perceived in Chekhov) that it’s impossible not to speculate what might have happened if he had continued. The play was published in German and English, but there are no production credits, and you can only assume that he was a natural playwright who never found his theatre. Selections has generous representations of Finlay’s subsequent transformations, giving a complex perspective on his unwavering and very particular investigation of the possibilities of the poem. Included with Finlay’s more conventional poems – he often employed rhyme – are his one-word poems, ‘detached sentences’, Concrete poems, aphorisms and extracts from letters. It makes for a book of many pleasures: from provocations, such as his Jacobin Proverbs, to delicate, steely lyrics. Finlay’s work is refracted through the ideals of the pastoral and the domestic, which comprehended his notions of beauty, but the order he creates is always in tension with extreme disorder: the natural world, destruction, revolution, war and death. There is an insistence and drive in the work that feels as uncompromising as the oeuvre of Beckett. The book frankly examines Finlay’s controversial fascination with the deadly idealisms of Nazi Germany and the French Revolution. Finlay’s defenders have sometimes muted these aspects of his work, but Finlay himself saw them as part of the essential tensions animating his poetry, a necessary re-engagement of Apollo’s aspect as a god of war. 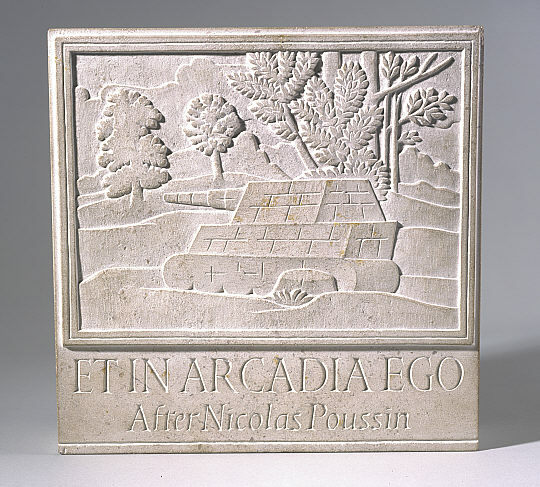 A famous example is his refiguring of Poussin’s painting Et In Arcadia Ego, which he redrew as an ‘emblem’ with a Panzer tank: a reminder, he said, that death was always present in the pastoral idyll. In a 1969 letter, Finlay remarked: ‘I must be about the only contemporary writer who believes that the purpose of art is to – oh dearie me, I forget exactly what – let’s say: be beautiful.’ In his unfashionable insistence on beauty, his demands that poetry be uncompromisingly ‘pure’, and especially in his classicism, Finlay set himself outside the counter-culture of the 1960s, while at the same time placing himself at the centre of the avant-garde. As he said in an interview, ‘I seem on the edge because I’m in the centre.’ His life and his work were a tightrope act: his work expresses these contradictions as opposing energies which energise, rather than neutralise, each other. there was no march of course as no one is on our side, but we invented it, and I said there would be a zeppelin, taschiste banners, enormous balloons, etc., and that we would march on The Writer’s Conference; so everyone believed it and the Magistrates made a special order to ban it. ‘March Banned BUT Feud Goes On’ as one paper headlined it … nervous trouble or not, we took a taxi up [to The Scotsman Newspaper] and Jessie [McGuffie] punched the literary editor. Oh, that poetry were still such fun! Alec Finlay relates his father’s embattledness to his continual struggle with mental illness – he suffered for most of his life from acute agoraphobia – and describes his life’s work as essentially shaped by his sense of exile. It was certainly a state Finlay helped to foster, but it was an exile marked by close, and sometimes fractious, relationships with most of the significant innovative writers of his time. This book serves as an excellent introduction for those unfamiliar with Finlay’s work, but it’s also a significant addition to the critical re-evaluation that continues after his death. It’s an essential purchase for anyone interested in the poetry of the second half of the twentieth century. And, not unimportantly, it’s a delight. Thank you for a very interesting review. I’ll need to track this down. Thanks Rhona – if you can’t find it in bookshops, you can buy direct from the publisher, University of California Press, online.